For the guy who enjoys grilling the Barbecue Enthusiast Gift Basket includes spice blends and all-natural sauces that will turn a BBQ into a gourmet meal. Plus there are some snacks for dad to enjoy while he is cooking on the grill including popcorn that is flavored like spicy buffalo wings and pretzel twists by Auntie Trudie's. I love family movie nights and of course popcorn is the perfect thing to snack on when enjoying watching a film. For the dad who is really into movies like me pick up a unique popcorn sampler to spice up this treat. The Backyard BBQ Popcorn Sampler includes flavors like Hickory Maple Bacon, BBQ Ribs, Buttered Corn on the Cob, and Watermelon to munch on. Try something out of the ordinary and you won't be disappointed with these different popcorn flavors. This is a nice gift for beer-lover dads! Let them enjoy some beers from various locals around the world that you may not normally find in your local beer aisle. Plus it comes with some gourmet snacks that go great with these tasty beers. As dads like myself hit 40+ high-blood sugar and Type 2 Diabetes begin to become a problem for many men. I'm struggling with that myself. Finding delicious sugar free snacks can be a real task. This basket is full of sweet treats and tasty goodies that fathers can enjoy without the sugar that they're supposed to be avoiding. Who doesn't love pizza?! This kit provides everything you need to make your own fresh pies at home. In addition to gourmet ingredients it also includes a 15" Pizza Stone with rack to provide an authentic Italian restaurant quality experience. The Belgian chocolate-dipped Oreo cookies from GourmetGiftBaskets.com taste incredible. Plus they are decorated so that fathers know that Dad is #1 on their special day. Use code FDAY10 in the checkout when placing an order to save 10% off Father's Day purchases. 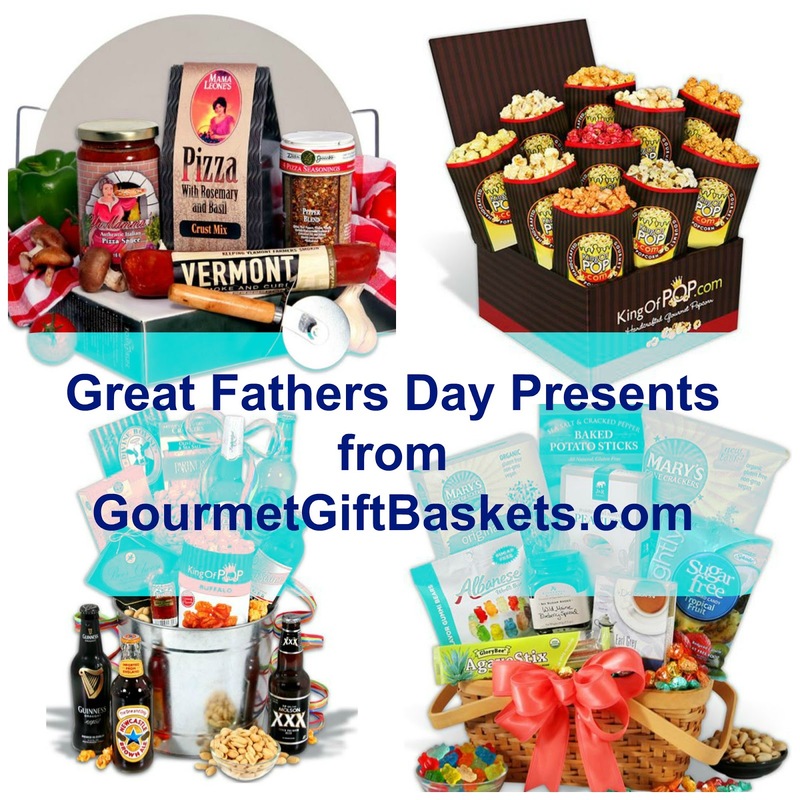 Receiving a delivery from GourmetGiftBaskets.com is sure to put a smile on any father's face! Those all look awesome. I would love to get any of those for Father's Day. I love Gourmet Gift Baskets! 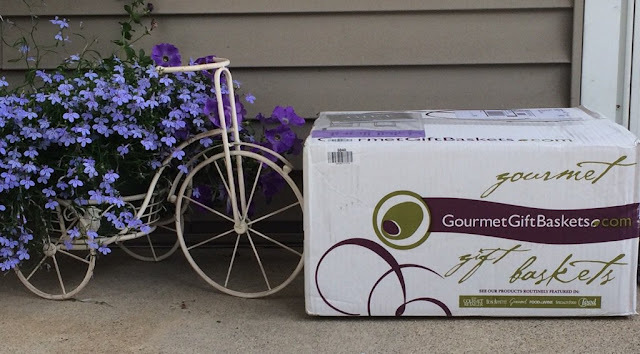 We searched high and low for the perfect house warming basket a few years ago and Gourmet Gift Baskets had the perfect one! The new homeowners were so thankful! I hadn't thought to purchase a Father's Day basket! Woohoo! I've been looking for something to round out my husband's Father's Day gifts, and I think I just found several options! The Around The World Beer Bucket looks like a winner to me. So many great ideas here! I bought my sister a basket from Gourmet Gifts. It was packed full of very nice items for a spa day. They make the best gifts! My husband would surely appreciate any of these gourmet baskets. Thanks for sharing these ideas. I think everyone loves a gift basket full of goodies!! These look like great Father's Day gifts!! These all look like great ideas! My dad would love any of these for sure! The beer one may be his favorite. I have heard really good things about Gourmet Gift Baskets. I think my husband would love it for Father's Day. My husband doesn't quite go for this kind of stuff. However, I do! lol I want this for a late Mother's Day present! I absolutely love baskets like this. I wonder if my husband would, I never thought about a gift like this for him before. My husband would enjoy getting a gift basket full of goodies. He hasn't given me any suggestions, I do plan on taking him out to eat. These are SUCH great gift ideas!! I love gift baskets and love making them, but sometimes there's just no time haha! These all look wonderful and there's definitely something for everyone with this company. This is a great outside of the box gift idea. I think the mister would like the popcorn basket. Gift baskets can never go wrong! Seriously, what dad doesn't like yummy treats? I always get something like this for holidays, and it's always a hit! These are great ideas! I love giving gift baskets! You can add lots of stuff they love! I'm pretty sure that my dad will surely love it either my husband. Such a great gift ideas. My husband would love any of these gift baskets. Thanks for the inspiration, I need to get my husband one. Thanks for this. I was just thinking about how I have no idea what I am going to get my husband this year! These are some great father's day gift ideas. My husband would love the popcorn or around the world beer! I think the world think gift baskets are only for women. Men can appreciate a good gift basket too these all look great! How did I never know about this before?! These look awesome. My favorites being the beer basket and chocolate dipped oreos. Great gift ideas!